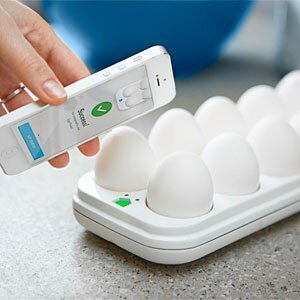 Load your eggs into this expensive plastic tray and it will tell your phone when your eggs are about to go bad. It will also show you which eggs are the oldest and should be eaten first. None of this makes sense, when you consider that eggs are sold in a paper carton with an expiration date, and if you have two cartons, you can eat the eggs from the older one first.